Just a quick reminder that we'll be hosting some fika at this weekend's Indietracks festival. Pop down to the workshop tent on Sunday at 3pm for some teas, cakes and probably a bit of music from a few Fika artists. Both Horowitz and Moustache Of Insanity are playing during the weekend and there might be one or two special guests as well. We'll have some cassettes and records for to buy as well. See you there! The first time I met Andreas, he was late. It was my first lesson in acoustic physics, and I was quite surprised by seeing the ex-drummer of Quit Your Dayjob suddenly open the door and quite unsuccessfully try to sneak into the classroom without being noticed. As the term went on, we explored our mutual love of weird indiepop over the gross excuse for coffee you could buy for 20p at the cafeteria. I listened to his solo project Allt Ar Musik on his Ipod and instantly liked his twisting and turning swedish lyrics. I’d had the idea of swedish indiepop songs about swedish indiepop for quite some time, and Andreas was the perfect partner for this project. We translated our favourite namedropping songs and wrote some of our own (as you might have noticed, the song Andreas is a cover of my song Andrew, I thought I was quite witty when I came up with it). I can’t remember who played what when and where, but I have a strong memory of Andreas playing saxophone in a hearing test room in the basement of our school, and I know I was quite happy with my bass playing somewhere at my work one late night. Does it really matter? We did it together, with a little help from Lars Diurlin and Emmy Hogstrom-Tagesson. Thank you! Three years later, Fika president TomA dug up these tracks and we could finally release them properly. I still think they’re quite good. 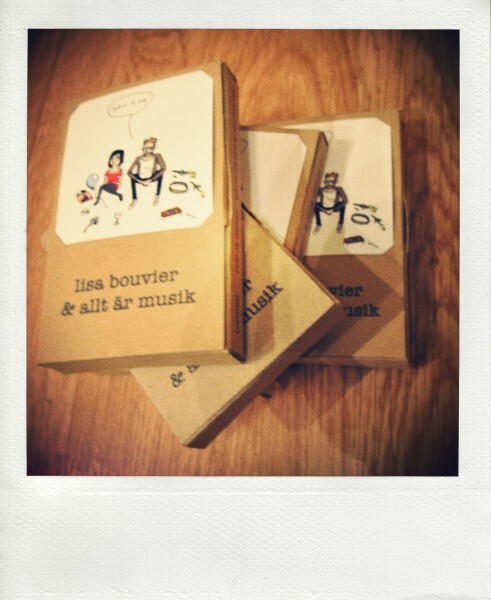 You can buy Lisa's EP at our shop. ...with Horowitz, Moustache Of Insanity, Lisa Bouvier and Lost Summer Kitten. To celebrate the announcement of our launch gig, we've made the whole of Lisa Bouvier's debut EP for us available to stream on last.fm. You can go here to listen to it in its entirety. This is the launch party for the new diy indiepop cassette label, Fika Recordings. All four of our launch artists will be releasing a cassette EP tonight, so come along, there'll be cake! Tickets are £5 advance from http://www.wegottickets.com/event/103538 Tickets will be available on the door (£6, £4 unwaged). Doors at 8, LSK on at 8:30pm. We're very excited to be able to announce our first two releases will be from two of my favourite Swedish artists: Lisa Bouvier and Lost Summer Kitten. Lisa's EP is chock full of cracking energetic pop songs; Lost Summer Kitten have a delightful EP of downtempo wintery songs. Both will be released in February at the same time as cassettes from two of my current favourite UK artists - one are indiepop legends from the potteries, the other closely connected to a band who have made my favourite album of 2010... we'll be announcing names shortly, along with details of our launch party. We'll be showcasing all four artists, there'll be cakes and some indiepop tunes after to dance well into the night.